Happy Sunday everyone! I’m working on tons of gift guides and as always I’ve put together my personal “Wish List” for the season! When people ask me what I want for Christmas each year I tend to go blank and I can’t think of anything! Does anyone else do this? Taking the time to actually think about it helps so much so, I put together this list in case anyone else is like me and has trouble thinking of good gift ideas to tell your friends and family! Let me know what you think and if you think I should add something to mine that you have on yours! 1. To Go Coffee Mugs – I would love to have some more to-go mugs in my house! It’s nice when I’m running out the door to take Aria to school or if I’m just wanting to keep my drink hot around the house! 2. Keurig Machine – A new coffee machine! I’m the only one who drinks coffee in my house so I waste a lot of coffee/time in the morning when I have to make a whole pot! This would be nice to have for just me! 3. New Sunglasses – I love these sunglasses and the shape is really fun! 4. Winter Duck Boots – I’ve been wanting some duck boots for a while now and I just love these ones! 5. 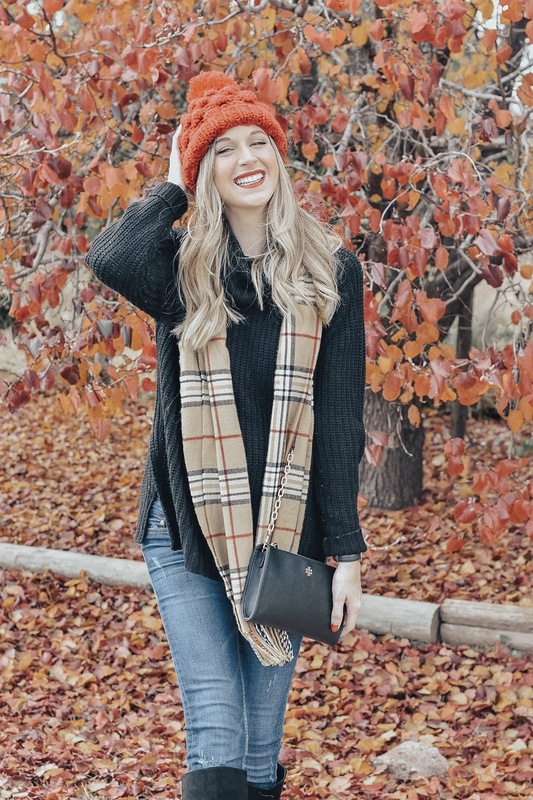 A White or Ivory Beanie – Loving the white beanies because they match so many outfits! 6. Stories from the Influencer Next Door – I know some girls in this book and as an influencer myself of course I had to add it to my Christmas list! 7. Colorful Pens – I’ve been wanting some fun pens to use for my 2019 planner and I think these would be perfect for scheduling all of my tasks. 8. iWatch Band – I love this leopard iWatch band and I’ve been wanting to have some different options to use/ trade out with my sporty one! 10. Yeti Mug – Another fun to-go mug option for my coffee! 11. Magnolia Cookbook – I love having fun cookbook around my house and even though I’m not a *huge cook, I’ve been known to get inspired and try new recipes every now and then! Plus, I’m sure my husband would love for me to use this gift! 12. Silk Pillow Case – I’ve been wanting to try out a silk pillowcase for a while now because dermatologists recommend having one and it helps with bacteria build up on your face at night! 13. Fluffy Slippers – CONFESSION… I already bought these for myself because they were on sale for Cyber Monday for $12 and you guys… it’s the best $12 I’ve ever spent. The softest and comfiest slippers everrrr. The ones from Loft are sold out but these are really similar! 14. White Chunky Knit Blanket – I’ve had my eyes on a blanket like this for a while now and I would love to have one! They’re so soft and cozy and could match any decor in my house! 15. Sporty Baseball Hats – I’ve worn in my white Under Armour Hat and need some more options in white, black, pink, etc! 16. A 3- Tiered Stand – I’ve seen people decorate these in their kitchen and I’d love to have one! Plus they’re great for entertaining! 17. Maternity Leggings – In less than a month I’ll be in my third trimester and it seems like all I’m wearing these days are comfy leggings at home. I’d love to have some more options to wear over the next couple of months!